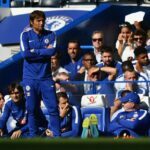 Antonio Conte proved during Chelsea’s Premier League opener against West Ham that he has not calmed down at all since Euro 2016. If anything, he might have increased the amount of crystal meth in his Red Bull espresso. Chelsea could have had two players sent off — Diego Costa and N’Golo Kante — but they both stayed on the pitch, probably because the referee was too terrified of being the target of Costa AND Conte’s combined rage, and Costa even scored an 89th minute winner. When Costa put Chelsea ahead, Conte went into celebration overdrive.